Danny Lewis goes in for a layup against Springboro. Ryan Foy drives the baseline to score against the Panthers. Dawson Walker drives past Logan Zier to score a layup during the second half. 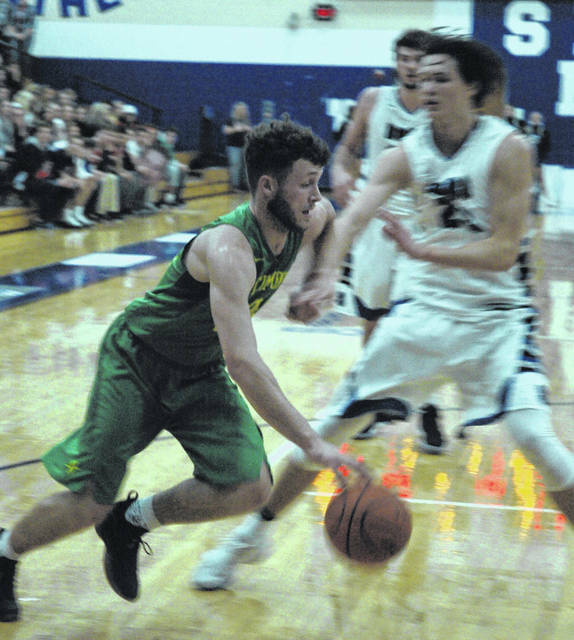 SPRINGBORO — Leading by 10 points by the end of the first quarter and 34-29 at halftime the Northmont boys basketball team suffered a letdown of sorts Friday night at Springboro. The Thunderbolts distributed the ball well in the first quarter to take a 19-9 lead entering the second stanza. Northmont buried a trio of 3-pointers in the first quarter; two by Donavin Wallace and one by Cameron Rucker. Springboro knocked down a trio in the second quarter; one each by Kaleb Tabor, C.J. Emanuel and Connor Grevey to cut the Thunderbolts’ lead to five at halftime. 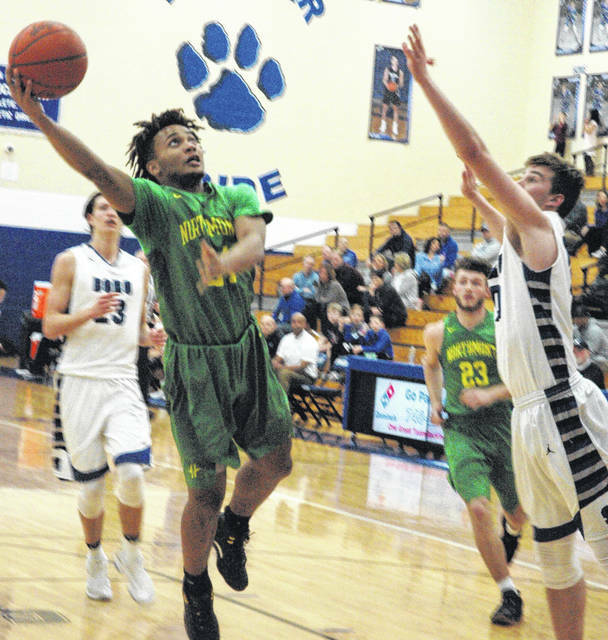 When play resumed in the third quarter Northmont players seemed intent on playing one-on-one basketball and the Panthers zeroed in on the basket from the perimeter to bury five 3-pointers to take a 53-42 lead entering the fourth quarter. 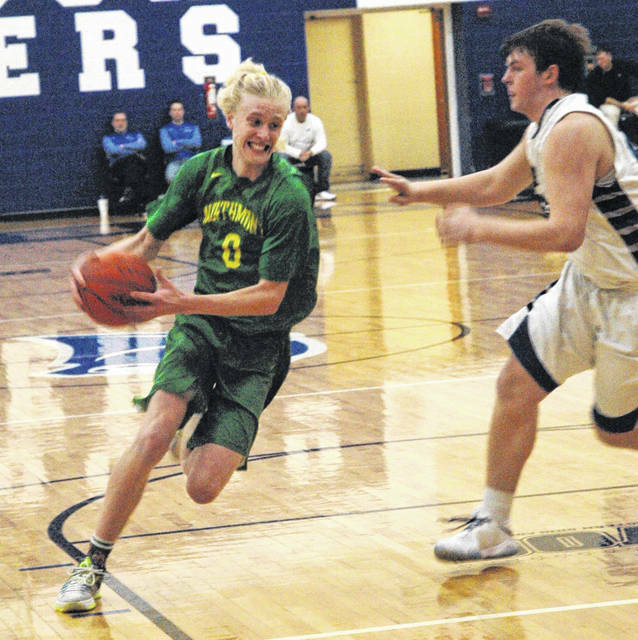 Springboro hit two more treys in the final period and Northmont never managed to regain its fluid first quarter play as the Panthers went on to post a 69-57 victory. The win lifted the Panthers out of the basement in the National West division of the Greater Western Ohio Conference, which is where the Thunderbolts fell into with the loss. Dawson Walker paced Northmont with 20 points while Kaleb Tabor had 20 for the Panthers followed by Garrett Powell with 14 and William Yates with 10. Northmont: Dawson Walker 8-3-20, Donavin Wallace 3-0-8, Cameron Rucker 4-0-9, Jamaal Linson 1-0-2, Ryan Foy 3-0-6, Danny Lewis 3-1-7, Prophet Johnson 2-1-5. Totals: 24-5-57. Springboro: Kaleb Tabor 8-0-20, Garrett Powell 6-0-14, C.J. Emanuel 1-0-3, Logan Zier 2-0-5, Michael Berner 4-1-9, Connor Grevey 2-0-5, Tom Arrington 1-0-3, William Yates 4-1-10. Totals: 28-2-69. 3-point goals: Northmont 4 (Wallace 2, Walker, Rucker); Springboro 11 (Tabor 4, Powell 2, Emanuel, Zier, Grevey, Arrington, Yates). Records: Northmont 7-11 (1-8), Springboro 6-13 (2-8). JV Score: Springboro 56 Northmont 54.